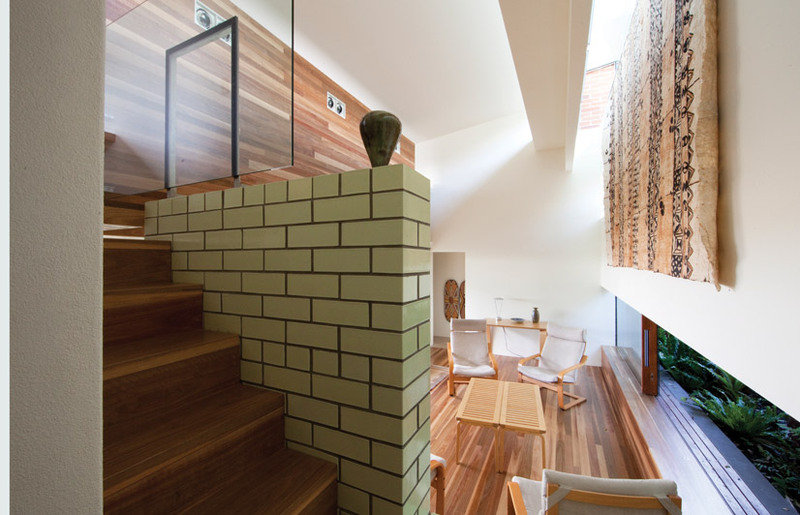 Brisbane is well known for its hilly topography and the timber and tin forms that perch within its verdant landscape. Yet, on closer inspection, the reality of Brisbane’s inner-city context cannot be so neatly described, being more diverse than this image presupposes. 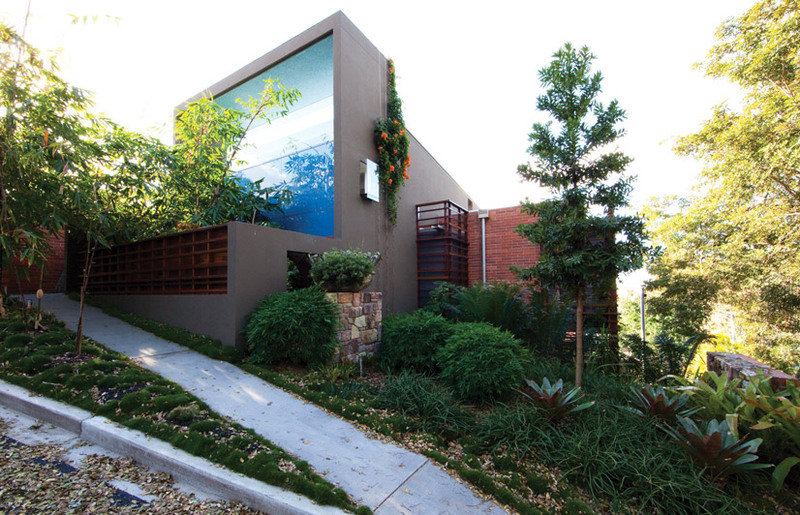 Donovan Hill’s Z House, embedded into the slope of Teneriffe Hill with commanding views to Moreton Bay, revels in its often dense and uneven context, doing so in a way that exceeds an idealised view of Brisbane’s suburban typology, substituting this image with other critical realities of place. The house is situated on terraces carved into the hillside, made from walls that retain the land yet also form edges from which the rooms of the house emerge. 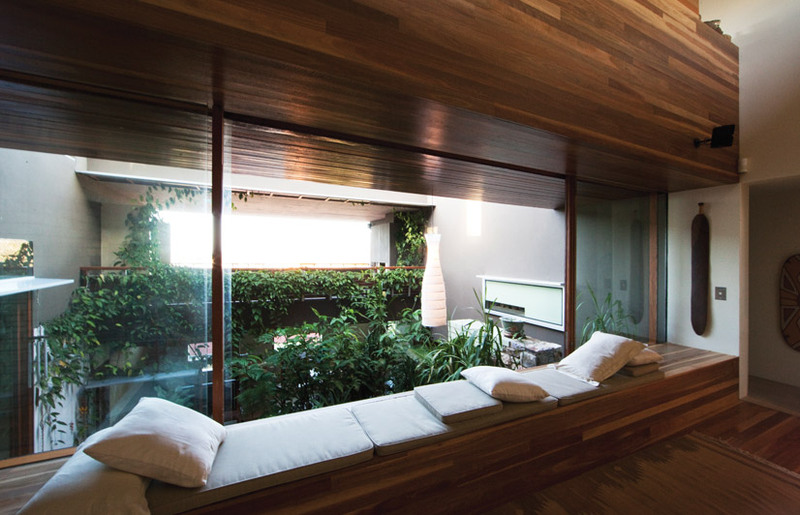 These rooms upon terraces allow for discrete spatial connections between inside and outside, making positive spaces on the building’s edges that are integral to the home. Such an approach is fruitful, considering the constraints of inner-city sites, where neighbours are close and garden space limited. 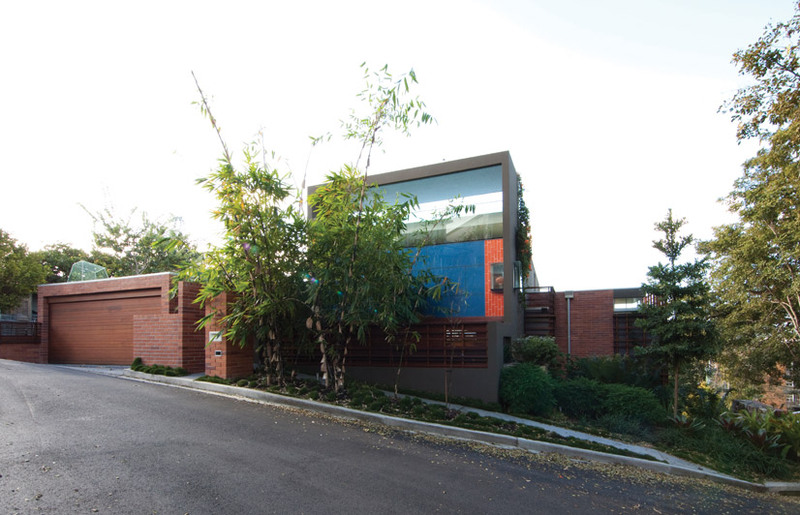 This understanding of inner-city blocks and their potential is clearly opposed to the vision of the Queensland house as a ‘palace’, with enough garden around it for the occupants to enjoy a splendid isolation. 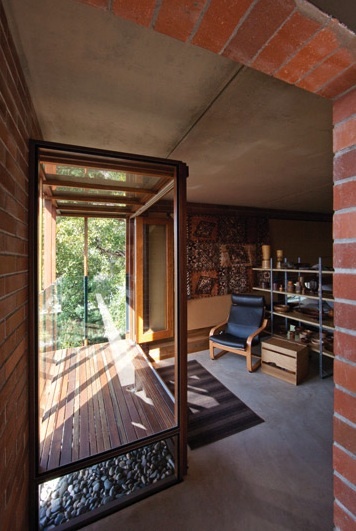 In the Z House, the delight of isolation in nature is not so much experienced externally, but in the heart of the home – its central but open interior. 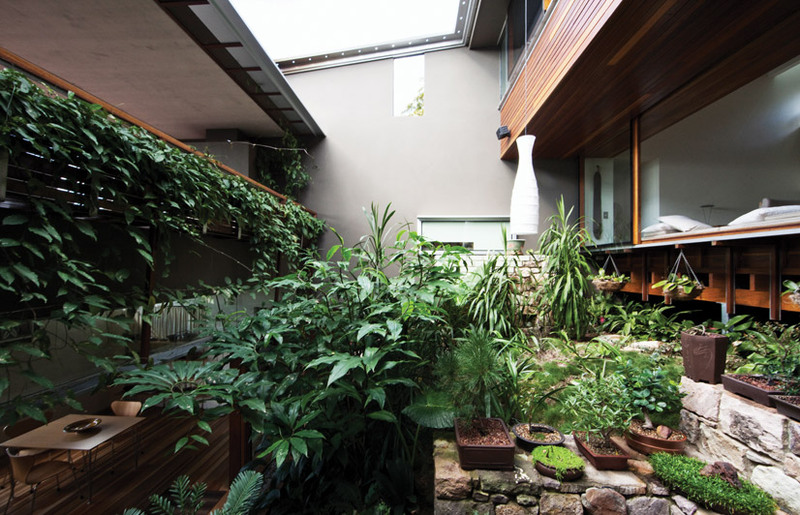 This intentional spatial inversion has generated a tiny inner-courtyard garden containing rare native Australian plants, carefully tended by the owner. 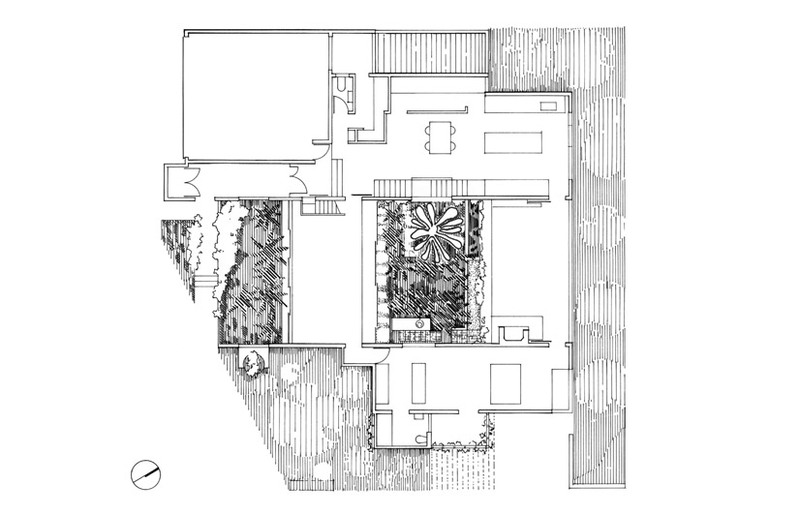 The plan of the house is entirely organised around this green courtyard, which you can either step into to find a stone seat, or survey from the interior. 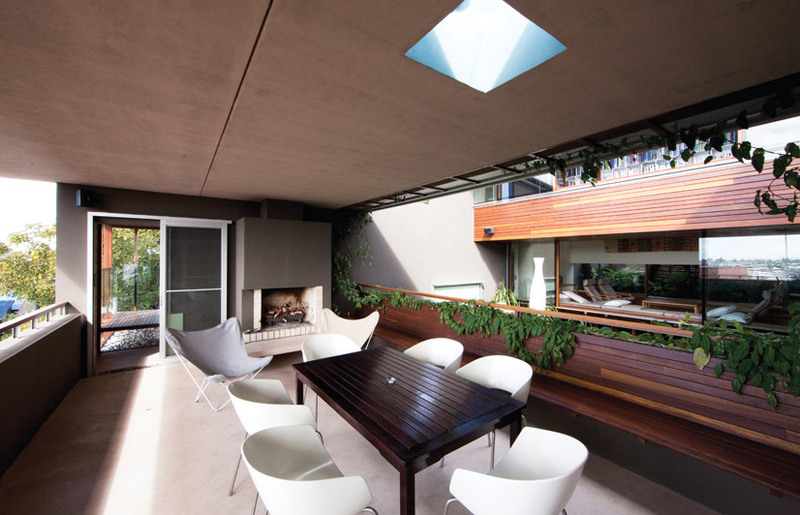 The garden core constitutes a new type of functional and climatic solution in Donovan Hill’s private house designs. Indeed, all the main rooms of the house at different levels – private library, bedroom, living room, kitchen, outdoor room and the guest living room – face onto it. This arrangement ensures a perfect cross-ventilation system, which takes advantage of the breezes approaching the hill from Moreton Bay. Another consequence of this unusual plan is an absence of corridors, which enables a sense of fluid circulation through the spaces of the house. The main effect of this spatial inversion is to constitute the house as a type of miniature public realm. The north-south section clearly reveals the architect’s strategy to create a complex inner space that alludes to an idea of urbanity. The urban metaphor is reinforced by the continuous changes of level in the house that invite one to walk through the spaces, always perceiving different viewpoints on the inner artificial landscape of the house. Like an architectural promenade, the barbecue and the external kitchen in the outdoor room, as well as the internal kitchen, inner staircases and a tiny observatory set in the bedroom, are conceived as individual architectural objects, which piece together like a little city within the city, in a considered and controlled juxtaposition of scales. The use of brick intensifies the urban associations of the building: it is employed for both external and internal walls – brick already being a material in widespread use within Teneriffe, where a series of restored and converted woolstores are located. A secondary entry to the house completely formed out of brick has the intimate urban feel of the Venetian sotoportego, those dark and narrow passages that connect the network of public lanes. At the same time, the two frameless openings on the western wall play a somewhat ambiguous role: apparently made to set up a sky view from the garden, they also contain the potential for theatre, as imaginary visitors or passers-by might also be pictured in the spaces, to become part of the urban scenography on offer. 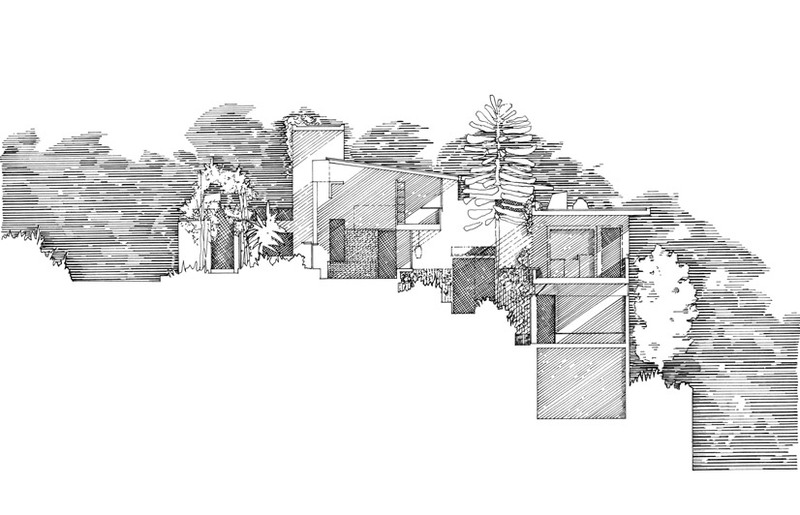 The fragmented nature of the house is also captured on the exterior in its decidedly uneven elevations. These are due to the tight but varied adjacencies given by its context. The side to the distant view over Moreton Bay provides the eye of the home, yet it is difficult to look back to it from the exterior surrounds. The side to the neighbour on the west is spatially animated but similarly closed. To the street entry another face of the house opens, but discreetly, presenting objects of the interior to public view (a ceramic caught in a light-filled window frame and glimpses of the vault of the interior beyond) without revealing anything of the private space. 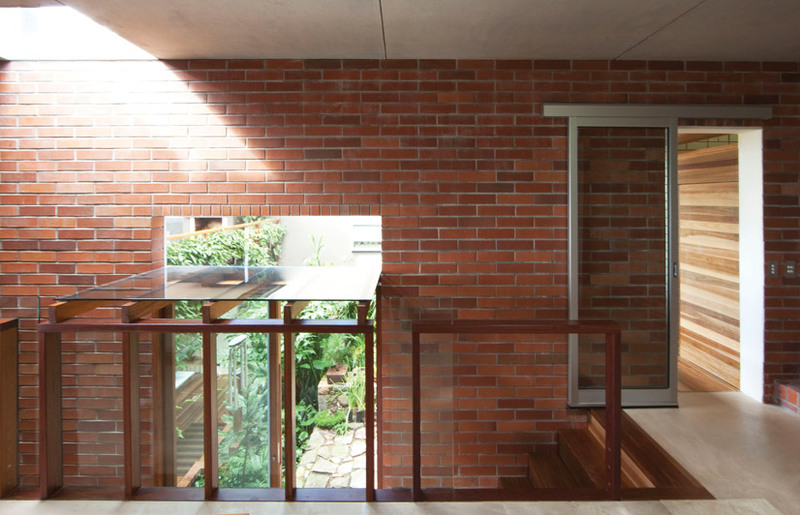 It is only against a small public park to the east that the house resolves into a singular architectural gesture – a carefully composed facade – framing the secondary entry and providing a face of the building to look back to. The idiosyncrasy of the building’s parts may result from contextual contingencies yet, at the same time, there is no attempt to ‘neaten’ the whole or present a formally based unity. From the outside, it is difficult to conceive of the house as representing a clear and singular type in the manner of the classic Queenslander, with its pyramid roof and veranda fringe. The true eccentricity of the Z House form is revealed in viewing a small-scale model, which shows just how much the parts are left to ‘be’ rather than moulded together as ‘high’ architecture. The strategy is to let the house be determined by the experiences it could offer to its occupants in the interior, not the exterior. This could be seen as problematic, but only for those who do not perceive the architectural endgame – a unity of experience, rather than one of form. Antony Moulis is senior lecturer at the School of Architecture, The University of Queensland and deputy director of the ATCH Research Centre. Silvia Micheli is assistant professor at the Faculty of Civil Architecture, Polytechnic of Milan. In 2010, she was visiting fellow at the ATCH Research Centre. Great idea for Brisbane inner suburb but what’s with the different brick in image 5..
Great Concept.. What is the name of the colour on the exterior Feature walls…??? Great Modern Look..